Somehow, someway, Jared Cohn has carved out a decent little career as an actor, director and screenwriter. 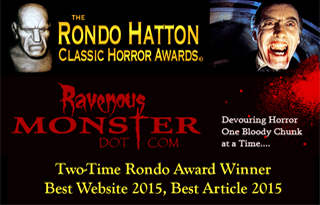 He seems to stay busy cranking out low-budget horror fare. And, with his latest directorial effort, Devil’s Domain, from Cleopatra Films, he even managed to snare the venerable Michael Madsen for a primary role. To take it a step further, his script takes aim at a host of contemporary issues — the pervasiveness of social media, bullying, bulimia, sexual orientation — and pounds them into focus with a soundtrack featuring Iggy and the Stooges, DMX and Onyx, among others. It’s enough of a track record to make one think Kid Cohn has a future. But if, as they say, the Devil is in the details, don’t hold your breath. It’s all for squat. This mess of a movie disintegrates scene by scene, sabotaged by lousy dialogue (what little of it there is), horrendous acting, sinful cinematography and ineffective effects. It’s truly a shame, because the premise had promise. Lisa Pomson (Madi Vodane) is our prototypical angst-driven teen. She’s a lesbian whose advances toward best friend Rhonda (Brenda Tucker) end that relationship and make her a pariah at school. It’s all exacerbated by social media, used here — and everywhere these days — as a way to attack, demean and ultimately destroy those caught in the crosshairs. And Lisa is most definitely caught in the crosshairs. Male “pal” Andrew (Zach Kozlow) shows up one evening purporting to want to comfort Lisa. Instead, he plants video cameras in her bedroom and bathroom that catch Lisa binging, purging, even masturbating. When the resulting video goes viral, Lisa considers suicide. Even Lisa’s mother (Kelly Eric Decker) is less than helpful, asking her daughter, “Are you a dyke now?” and then mandating therapy. Then comes an online intercession: The mysterious and seductive Destiny (Linda Bella) introduces herself via webcam and arranges to meet with Lisa. We soon discover Destiny is actually Satan (who knew the devil had a French accent? ), who makes a pact with Lisa that allows for the gruesome killing off of her many tormentors. Lisa is lured into all this initially through overpowering thoughts of fame, lust and revenge. But when her conscience finally comes calling, the devil’s true purpose is revealed. And let’s just say the dawn of spawn is upon us. If any of this sounds remotely interesting, let me tamp down your expectations. 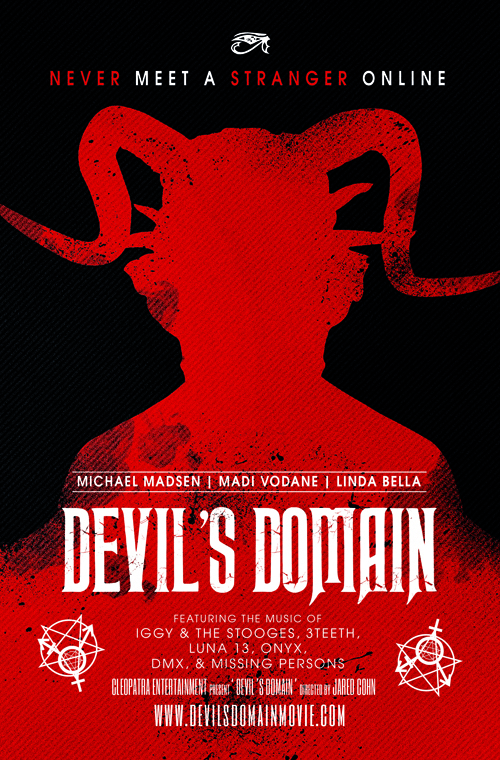 Devil’s Domain is our introduction to Miss Vodane, who as Lisa takes the acting expression “wooden” to a new level. Let’s call it “cement.” And the demonic Miss Bella is in that concrete mix as well. To be fair, Kid Cohn’s humorless, stilted dialogue gave them about as much to work with as a Trump Twitter tweet. There are so many awkwardly long pauses in the script that the actors stood slack-jawed until the camera mercifully cut away. Frankly, Cohn doesn’t get much credit for anything: The sets, wardrobe, lighting — all pedestrian, at best. And if you’re wondering why Mr. Madsen, as stepdad Bill, is noticeably absent from most of this review … well, it’s out of respect for a body of work that once generated compliments. Now it seems he’s settled for generating paychecks. One can only hope he earned a significant portion of the half-million budget spent on this tripe, aka Devil’s Domain. Harsh? You bet, and deservedly so. I have NO sympathy for this Devil.